Can't say we're surprised by this, but turns out Verizon's decided to delay the launch of its Samsung Droid Charge -- originally scheduled for today -- at the very last minute. According to an internal email we obtained, the blame's on "unexpected delays" and no new date has yet been set. This makes sense, considering it wouldn't do Verizon much good to launch a new 4G Android when its LTE service is still down (for over 24 hours and still counting). Ah well, this 4.3-incher better be worth the wait. Update: We're hearing reports that LTE is gradually being restored across the states, and our own Myriam Joire also sees 4G connection in San Francisco. 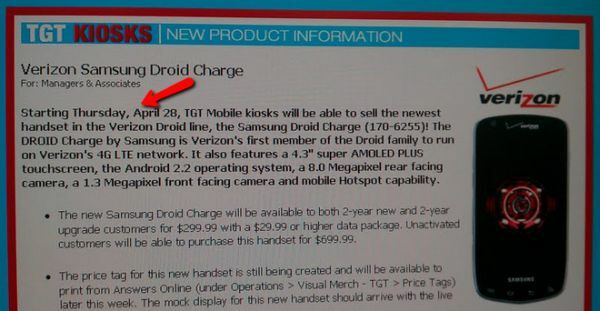 That said, at this stage it's unlikely that the Droid Charge will resume launch today. Update 2: Apparently the folks at Target aren't picking up what Verizon's putting down, as a tipster has told us it's releasing the Charge today as planned. Picture's after the break.